Our German Shepherd pup, Princess, is 5 months and now my son had an asthma attack and I had to take him to the emergency room. I was told that he might be allergic to our new pup. It is my understanding that it is the dander from the pup that might be causing him to have a reaction to the pup. Is there anything I can wash or put on the pup to prevent this? We keep Princess on the tile floor area of our home now and make sure my sons washes his hands often. Join in and write your own page! It's easy to do. How? Simply click here to return to GSD Questions Form. 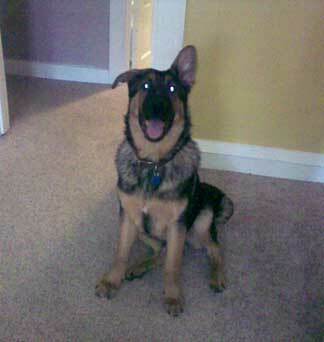 I promise to use it only to send you German Shepherds Rule. Thank you for this web site. Very informative and well written. I often advise my shepherd people to visit here for information. Again GREAT JOB. What a fabulous website!!! I really enjoyed reading about the history of the dogs. There is a ton of helpful information on here and defiantly something for every reader to enjoy!!! I love and appreciate the helpful advice I found on your website!